I have never faced the challenge of praying where lions wait. I've never been like Daniel, prohibited from praying, and I haven't endured threats of hungry animals waiting to feast on me if I did. Am I ever hesitant to be "caught praying?" Or even to let people know I pray? Perhaps I'm shy about it with my family, neighbors, co-workers. If so, why? Am I willing to be known as one who serves God? If I think about my life today, what do I fear? Maybe I imagine all sorts of "lions" slinking around. 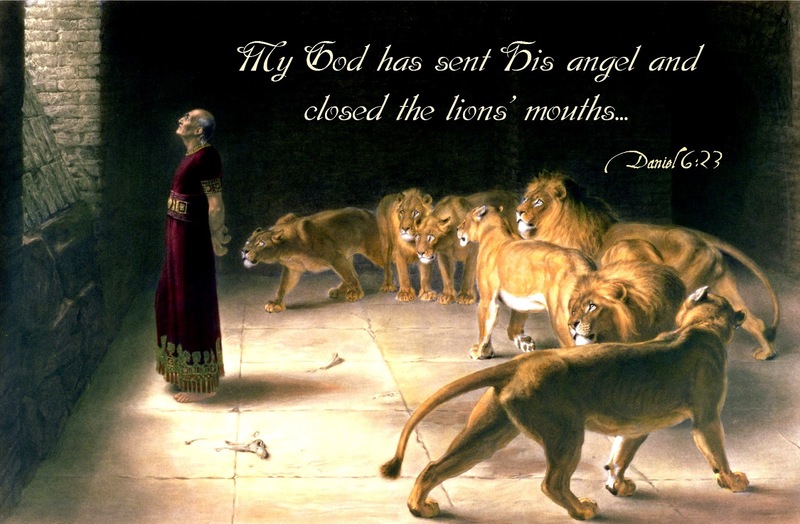 Can I make a decision (as tough as it may be to do so) to trust my Lord to save me, and "close the lions' mouths?" "I decree" wrote the king to all the nations after Daniel was spared, "that throughout my royal domain the God of Daniel is to be reverenced and feared. 'For He is the living God, enduring forever; His kingdom shall not be destroyed, and His dominion shall be without end. He is a Deliverer and Savior, working signs and wonders in heaven and on earth, and He delivered Daniel from the lions' power.'" He is a Deliverer and Savior, still working signs and wonders. And He can deliver us from whatever we may face.